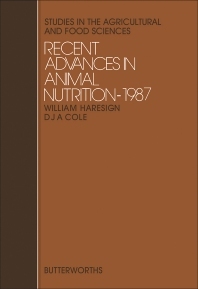 Recent Advances in Animal Nutrition — 1987 focuses on the advancement of techniques, procedures, and processes in animal nutrition. The selection first discusses techniques for identifying the metabolizable energy (ME) content of poultry feeds and the impact of declaration of ME value of poultry feeds. Methods for determining the ME of feeds; formulation of products and declaration of energy; species and ages of birds; and analytical problems are considered. The book also discusses the effects of diarrhea and wet litter in meat poultry; the inclusion of phosphorus in the diet of laying hens; natural products for egg yolk pigmentation; and the addition of enzymes to enhance the utilization of pig and poultry diets. The text also examines the nutrition of goats and cattle; immunity, nutrition, and performance in animal production; and methods of identifying the amino acid requirement of pigs. The book highlights as well the reactions of consumers to meat quality. Consumption trends; changes in eating patterns, retailing, and consumer purchasing patterns; and fatness and eating quality are considered. The book is a good source of information for readers wanting to study animal nutrition.